That was the greeting of the day for most Star Wars fans on this day and it could be heard all day at the MOSH Sci-Fi weekend event. 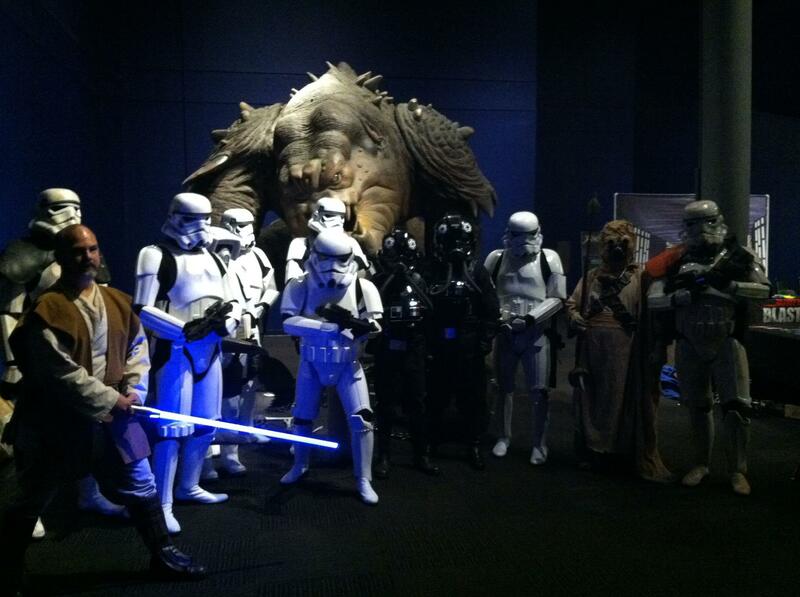 I had the great fortune to Troop on Saturday May the 4th at the Museum of science and History located in Jacksonville, Fl. 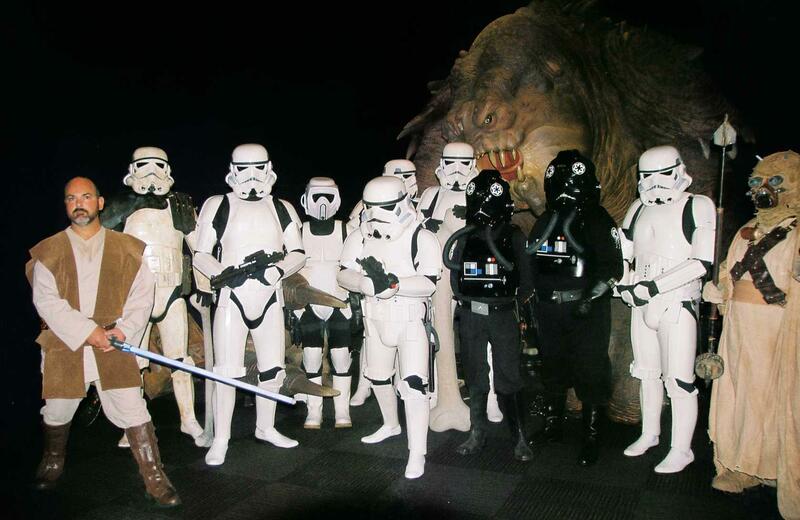 Group shot, I am third from the left. Click to enlarge. 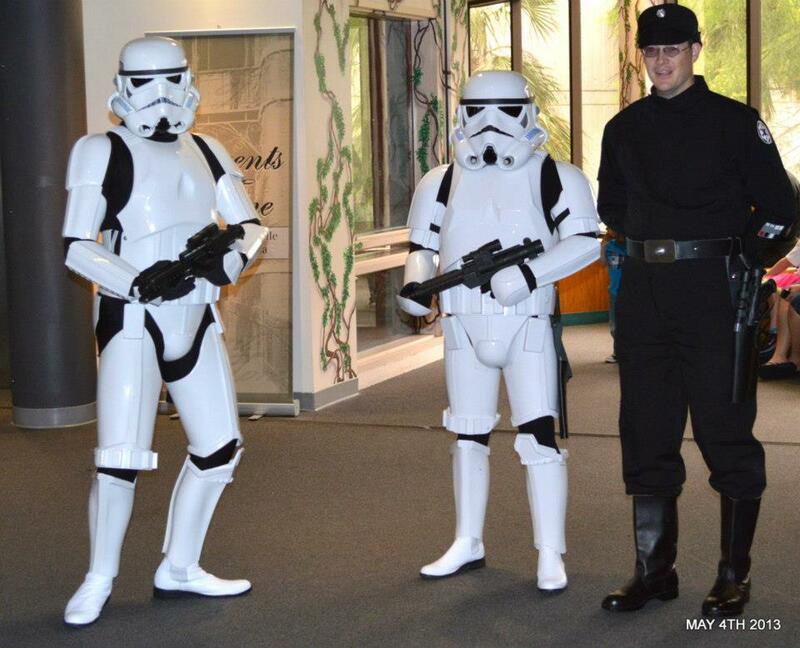 This Troop would account for my 8th Troop as a 501st member (Brother). This day started rolling at about 8:00 am, and well it didn’t stop until about 5:00pm that day for me. By far this was the longest I had been in armor and let me say by 5:00 pm I was almost spent but I knew I had one more Troop to do on this day but that’s another blog, well the next blog in fact lol. I didn’t know what to expect so I went into this troop with eyes wide open. After getting all the logistics completed of where to be and when to be ready I started putting on my Armor ready to head to the front lobby. A few other troopers and I headed to the front and saw about 20 people standing in line even with all the rain that was coming down on this overcast Saturday morning. Faces lit up from young and old when we came around the corner and you could see from their faces they could not wait for the doors to open. Little kids would run up to the glass windows and wave and we would wave back. They would run to their parents and you can see them talking a mile a min. After about 10 min the staff opened the doors and as fans would want to do they proceeded to ask us for pictures and we were happy to do it. It’s amazing the looks on the faces of both the parents and kids as they pass through the doors and sees us standing there in white armor; bring back memories for the parents and creating new one for the kids. Dads are every bit as excited as the kids, I even saw some mothers get a bit excited; sometimes they try and get the kids to take a picture with us. However like Santa some kids just don’t want to have any part of that. But for the most part the kids run up and the parents are happy and snapping away. After about 30 min or so we head back into MOSH to the second floor where the 501st booths are so we can do more meet and greets. The problem with that is you only get a few feet before more picture request is made and you get into your proper poses and let them have at it. After some time passes and a few dozen pictures are taken we are off again to the second floor. 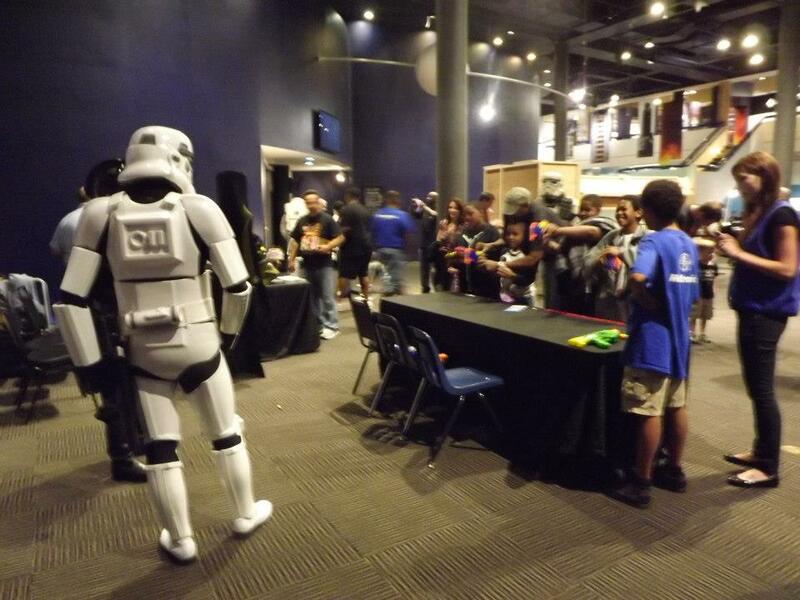 I had not been up there once the doors had opened so I was excited to see all the booths from both Star Wars, 501st and even dare I say Star Trek. Waiting for the fans to show up. 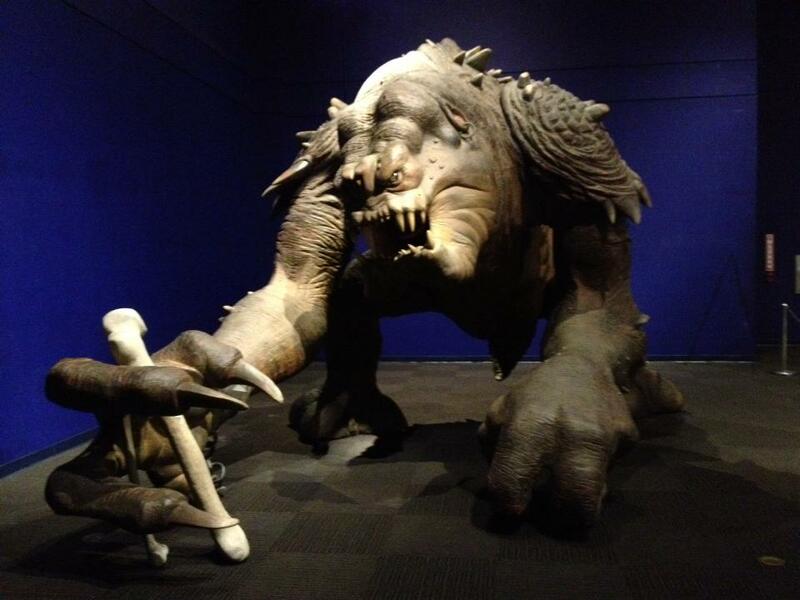 The best view when you get to the second floor by far is Roxy the Rancor. This girl is a sight to behold and if you ever get a chance you must go see her. The amazing amount of detail show the love, blood, sweat and tears put into creating this towering creature. I have seen her twice now, in person and I am still at awe over the craftsmanship that brought her to life. Please if you get a chance go and see her, and I am sure you will be as awe struck as I when I first saw her. Can you count the Nurf darts on this Trooper? My day was going along fine as I talked with little kids and parents, stopping for more pictures here and there and then it was time to become a target of the masses. 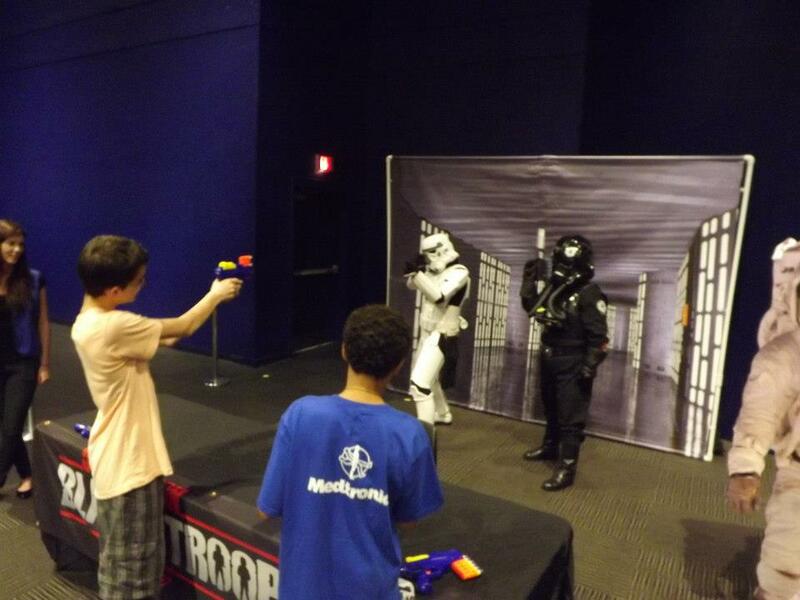 Yep it was my turn at Blast-A-Trooper. What is that you ask? Well it’s when I stand in front of a backdrop of the Death Star hall way and let anybody that wants to try and blast me with Nurf guns. Talk about drawing a crowed, who would pass up the change to Blast a Stormtrooper. Well as I quickly learned, nobody. For just about an hour I was the target of much joy to many that attended this wonderful event. The smiles, both happy and devious were on show as the kids picked up their Nurf Blasters and started blasting away. You would be surprised what areas of your body they like to target. Good thing are armor is plastic or there could be some real battle damage going on in the nether region. But all and all it’s a great time and the kids and parents really love this booth. 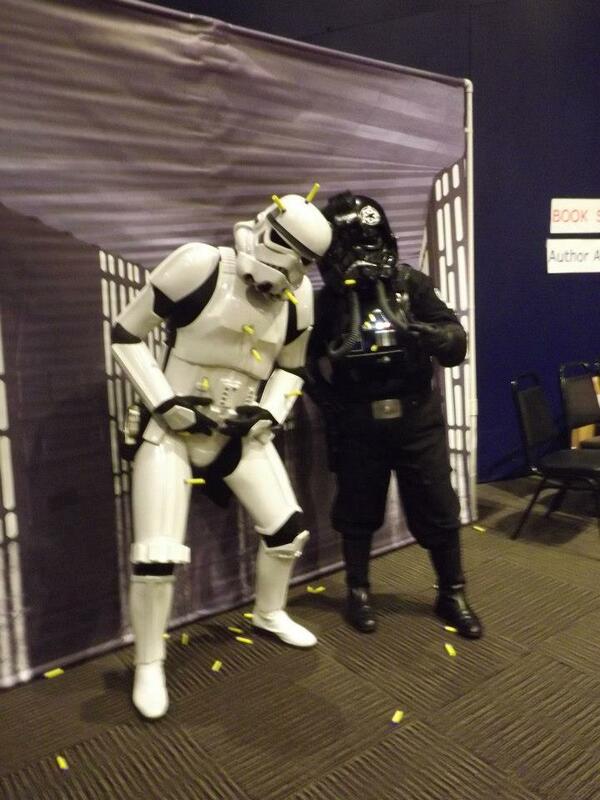 After being relieved of duty from the Blast-A-Trooper booth I headed back for some much need rest. I get a bit hot under all that armor and the bathroom was calling me so off I went. Rested and hydrated I headed back to the floor for a few more hours of photo opts. Time passes and I start to wrap up my day and a welcome moment it was to shed myself from all that is the Armor. 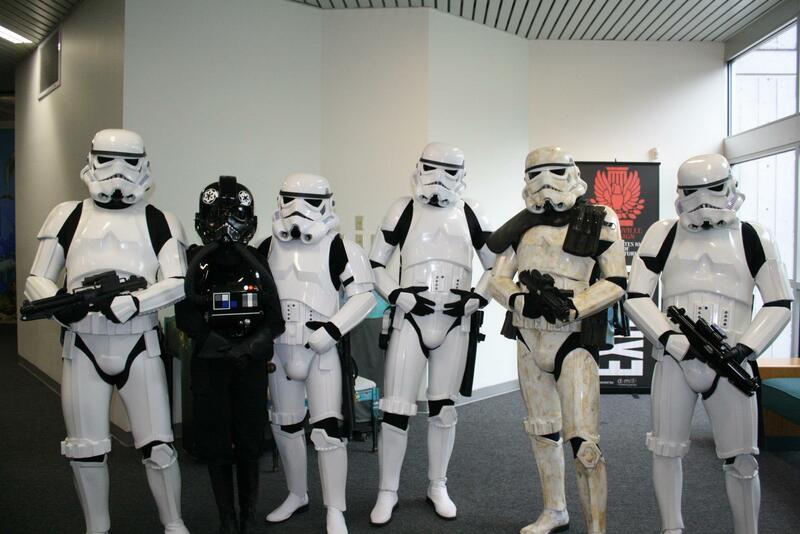 In closing of this fantastic day of Sci-Fi fun I would really like to thank the MOSH for hosting this great event and allowing the 501st to become part of it. I would also like to say job well done to all the members who helped out in this event. You guys rock and make events so awesome it’s truly an honor to be a part of such a great group of people. So if you missed out on all the fun, never fear I am sure MOSH will host this event yet again next year and I can’t wait to suit up and troop this wonderful event. 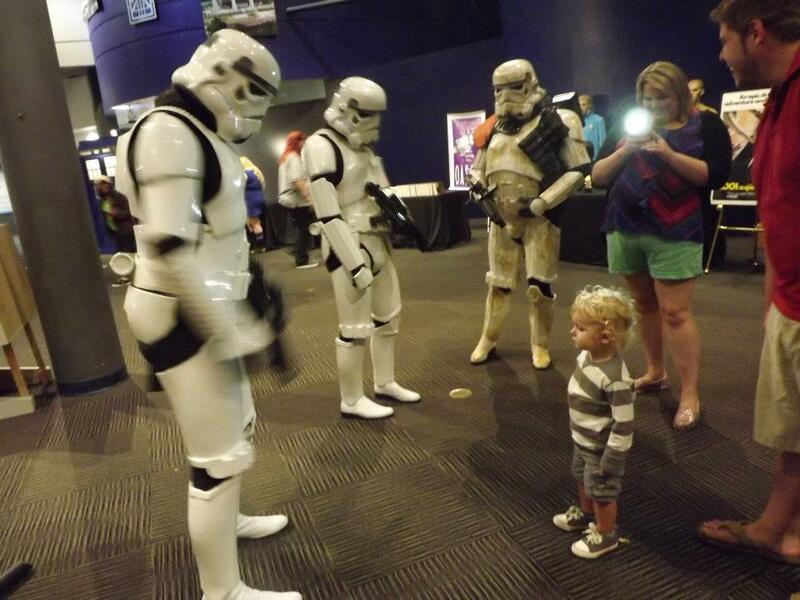 Here is one last photo of me and Lyndon (my son) who got to see me trooping for the first time.